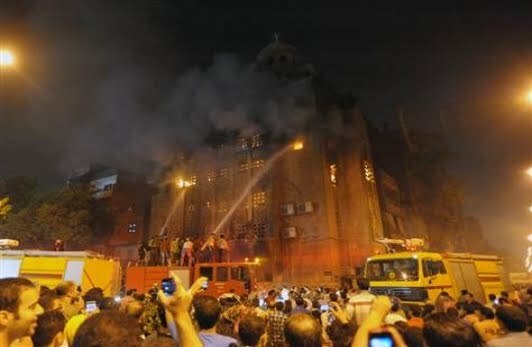 A prayer service was held at the Virgin Mary church in Cairo on Sunday May 8, 2011, one of two churches set on fire during clashes between Christians and Muslims on Saturday night. CAIRO — A night of street fighting between Muslims and Christians left at least 12 people dead and two churches in flames on Sunday in the latest outbreak of sectarian tensions since the revolution that ousted former President Hosni Mubarak on Feb. 11. Long suppressed sectarian animosities have burst out with increasing frequency since the rebellion removed the heavy hand of the Mubarak police state, threatening the recovery of Egypt’s tourist economy and the stability of its hoped-for transition to democracy. Officials of the Interior Ministry said at least six Christians and at least five Muslims died and about 220 people were wounded, including 65 who were struck by bullets. The Egyptian authorities vowed a swift response, announcing military trials for 190 people arrested in the violence, along with stepped up security at houses of worship and tougher laws against attacking religious institutions. Prime Minister Essam Sharaf, serving in an interim role under the military council governing the country, canceled a trip to the Persian Gulf states to preside over an emergency cabinet meeting, and Egypt’s most respected Muslim religious authority, the sheikh of Al-Azhar, denounced the violence. An overwhelming force of hundreds of heavily armed soldiers and riot police officers occupied the Cairo neighborhood where the clashes took place, evidently deployed prevent renewed violence and blocking off access to the church at the center of the battle. Garbage fires set in the streets during the clashes still burned in the area nearby, in a tangle of narrow and often-filthy alleys called Imbaba. 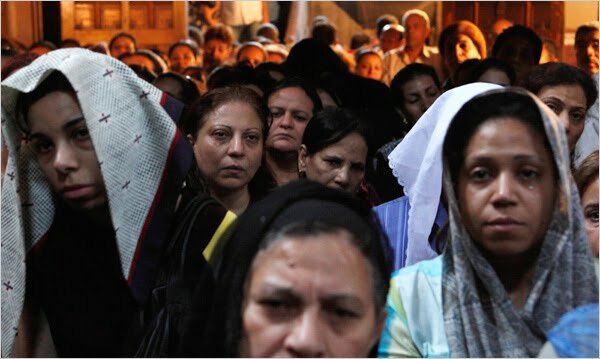 Members of Egypt’s Coptic Christian minority, who make up about 10 percent of the national population, have lived side by side with Muslims in the area for decades, even though the neighborhood is also known for its affinity for militant Islamic politics. Witnesses and other residents said that no organized group appeared to have led the weekend’s clashes. Some Christians in the neighborhood said they had seen a vanguard of bearded Salafis — adherents of an ascetic form of Muslim fundamentalism that is increasingly used as a catch-all term to describe Islamist militancy. But people on both sides said that the fighting pitted one group of young men from the neighborhood against another, along tribal rather than ideological lines. Like many recent episodes of Muslim-Christian violence here, the strife began over rumors of an interfaith marriage. Muslims in the neighborhood said a former Christian had left the church and married a Muslim. They said they had heard that she had been abducted and detained inside the Church of St. Mina against her will, reflecting a pattern of accusations that has recurred in several recent episodes of sectarian conflict. Christians in the neighborhood said that the story was a fiction, that there was no such woman in the church. Both Muslims and Christians involved in the fighting said that early Saturday evening a relatively small group of Muslims had approached the St. Mina church to ask about the purported abduction. Two young Christian men said they had heard reports that a group of Salafis were headed toward the church, so they had quickly gathered along with a group of as many as 400 or 500 to defend it. At about 6:00 p.m., one man said, their large group of hundreds of Christians faced a Muslim group of only 20. But within about an hour, a similarly large group of young Muslim men gathered in opposition. By 8 p.m., shots had been fired from a rooftop or balcony. The security forces soon arrived and fired tear gas to break up the melee. But clashes involving clubs, knives, bricks, Molotov cocktails and occasional gunshots continued until at least 4 a.m., exacerbated by an electrical blackout. Muslims set fire to the Church of St. Mena and, later, to the nearby Church of the Virgin Mary as well. The sectarian clashes follow a period of vocal interfaith solidarity around the time of the revolution in January and early February, when Christians and Muslims demonstrated together in Tahrir Square in central Cairo — with members of each group standing guard while the other group prayed. They vowed to work together for a new Egypt. But the transitional government has failed to convincingly rebuild and redeploy the police force after it was decimated by desertions during the revolution. And sectarian strife had been a problem even before the rebellion. A lightning rod at the center of much of the discord has been the case of Camilla Shehata, which also involved accusations of interfaith marriage and abduction. Ms. Shehata is the wife of a Coptic Christian priest. Some Muslims contend that she left him for a Muslim, only to be kidnapped by her husband and members of the Coptic Church. In retaliation for her purported abduction, Islamist militants carried out a church bombing as far away as Iraq and threatened churches in Egypt as well. The anger over the case may have played a role in an explosion at a church in Alexandria on New Year’s Day that killed more than 20 Copts. As recently as Friday there were rival demonstrations over her case that involved a few hundred Muslims and a few hundred Copts in the Cairo neighborhood that contains the Coptic Cathedral and one of the city’s biggest mosques. Muslims have often insisted that Ms. Shehata should appear on television to lay to rest the allegations that she had converted to Islam and then been abducted against her will. On Saturday, Ms. Shehata appeared to do just that, appearing with her husband on a satellite television network owned by a prominent Christian businessman here, attesting to her Christianity and urging Egyptians to move on. It was unclear if the broadcast had any influence on the violence Saturday night. In March, Muslims and Christians fought in the town of Helwan near Cairo. 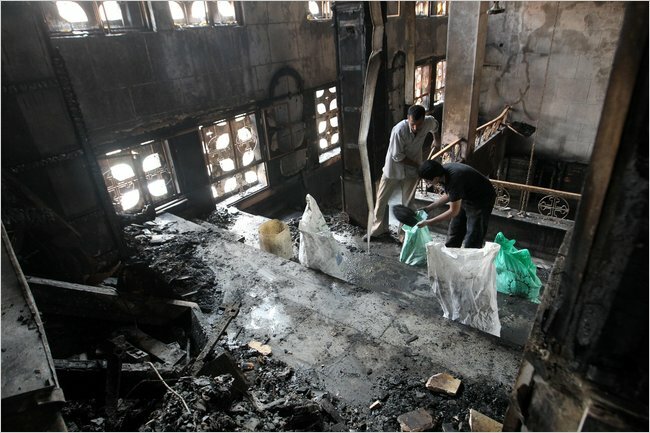 Thirteen people were killed and a church was burned down. In that instance, the spark was a rumored romance between a Muslim woman and a Christian man.